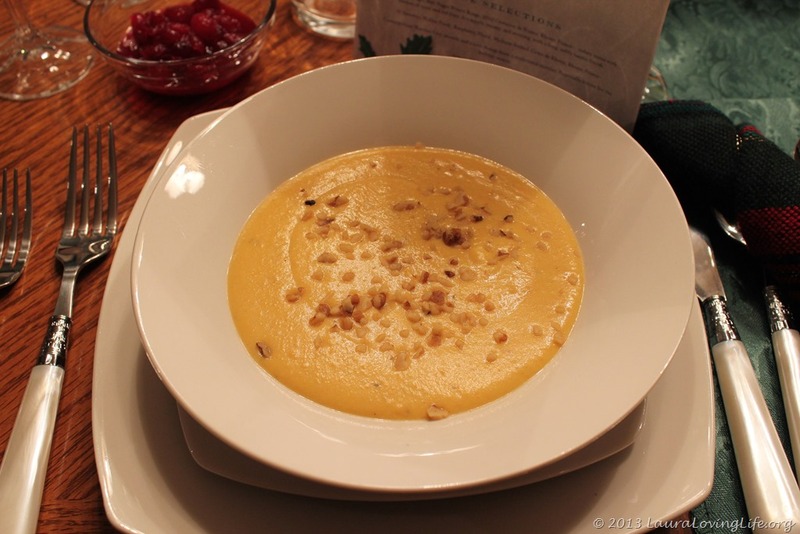 A great Holiday season soup! What better time than now to try new and exciting recipes? This is a simple and exceptionally delicious appetizer or first course to your meal. I topped mine with a little crushed walnut to give it some additional texture. This recipe is ideal for these cold winter months. It can be made ahead of time and reheated with a bit more cream added to keep it creamy. If you will be heading to someone’s house and are asked to bring a dish may I suggest this for you? I promise it will be a hit, and you won’t have any left to take home! I made this as an appetizer/first course for our Thanksgiving meal and our guests and family loved it, I made a huge batch and there was NONE left! If you want to spare yourself a bit of time you can purchase the already prepared squash (peeled and cut ready to cook) I cooked the squash in the oven first for 40 minutes at 350 degrees, just cut in half sprinkle with salt pepper and a bit of oil. Once done allow it to cool completely. You can then peel the squash really easy. If you don’t want to take so much time you can throw it in a microwave and cook for 5 minutes at a time until the skin start to come off, or take a more traditional route and cut the rind off yourself before chopping up the squash… I am getting ahead of myself; you will need the following for this easy and elegant soup! A topping of your liking again I used crushed walnuts for the added texture element that I personally though it might need. In a large saucepan, sauté onions in butter until tender. Add squash, chicken broth, marjoram, black pepper and cayenne pepper. Bring to boil; cook 20 minutes, or until squash is tender. Using an emersion blender blend everything together, add the Neufchatel cheese at this time. You can also puree the squash and cream cheese in a blender or food processor in batches until smooth. Return to saucepan, and heat through. Do not allow to boil. Add the heavy cream and milk until you get your desired consistency. Remember this is a rich and heavy soup, it is thick, and can be thinned by added additional cream or milk. I thought this soup was amazing, and apparently so did everyone else. Let me know if you try it or have a different version, I love changing things up a bit.